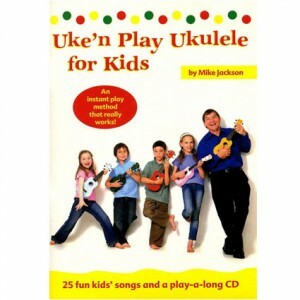 Learn the three basic chords C, F and G7 and 25 songs with ‘Uke’n Play Ukulele for Kids’ by Mike Jackson. This is a super little book to help kids (of all ages) learn how to play ukulele. The book uses a simple method of adding coloured stickers to the fretboard to allow quick identification of where to place your fingers to play a chord. With a little assistance from an older person kids as young as five will find it a helpful resource. There is also a play-along CD that comes with the book that allows you to feel the beat and improve your technique. You can buy it at a reasonable price too. I’ve found the cheapest place to buy it is from an Amazon site at US $10. But if you live in New Zealand try NZ $23 on Trademe, or your local music shop. I recently purchased the book ‘Ukulele for Kids – A Beginner’s Guide with Step-by-Step Instruction for Ukulele’. I can assure you the book wasn’t written by me, but by a much more accomplished ukulele player/author by the name of Chad Johnson and published by Hal Leonard. What lessons does the book cover? Bob Marley – Three Little Birds. The book also has a CD with 30 tracks for demonstration to help with the above lessons. The book would be a good starting place for teachers or parents who want to teach not only kids how to play, but themselves too. 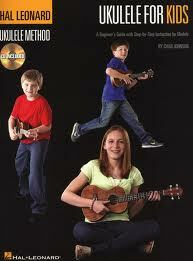 I’d also recommend it for kids from about 10 years of age who want to teach themselves how to play the ukulele. The only small complaint I have about the book is that it does not have a contents page. This would make it easier to go to various parts of the book much more quickly. Is it worth buying, and where can I buy it? Yes it is. Its list price is US $12.99, and can be bought at various online sites like Amazon and Fishpond (NZ) The book gives ukulele beginners a good grounding in learning how to play the ukulele. Once you know how to play you are on your way to playing a whole range of songs.